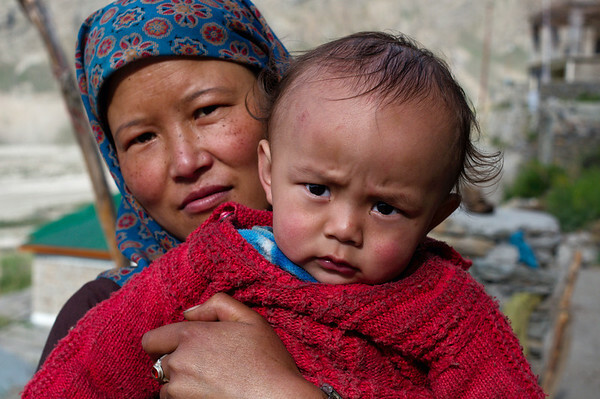 From a small tour office in Keylong we were able to secure four ponies and a guide to help us over Shingo La Pass. In retrospect we would have made our way to the tiny village of Darcha, where most of the pony owners live and negotiated there. Instead we paid a premium to the company subcontracting the services of the poor non-English speaking guides who are not as able to negotiate with foreigners. 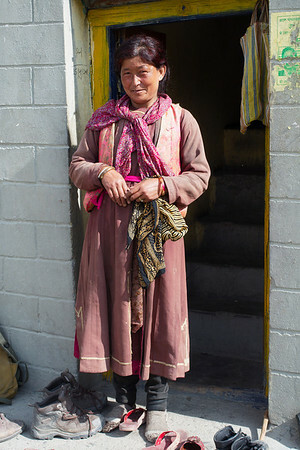 We met our guide Kesar at the tour office in Keylong a few days before departure. We agreed on a price and the number of horses that would be necessary for transporting three bicycles and most of our gear over Shingo La Pass. We settled on 10$/day per horse. Because Kesar didn't speak English we didn't have to pay the usual “guide” fee. We also agreed to pay for the days of return travel, as Kesar would accompany us only over Shingo La and then head back over the pass to his home. We agreed to meet in Darcha a few days later. We had Kesar's cell phone number and we were assured that we would not have any trouble finding each other in the 300 person village. 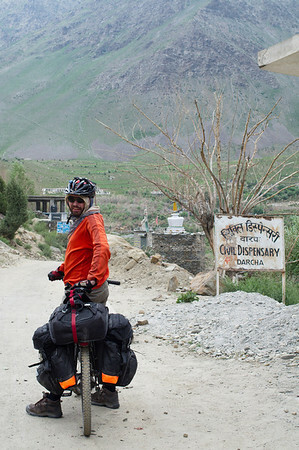 We left Keylong with the plan was to cycle a few hours to Darcha, pick up our ponies and continue on towards Zanskar Sumdo the Shingo La “base camp” and entrance to Zanskar. This didn't quite work out. Despite the size of Darcha we weren't able to locate Kesar. We weren't actually able to locate anyone. In the early afternoon, most of the village's inhabitants were working the fields and the village was nearly deserted. We crossed one elderly man who directed us to Upper Darcha a steep 30 minute climb away. In Upper Darcha we were told that Kesar lived in Lower Darcha. Our search lasted the better part of the afternoon and even involved another villager trying to get us to hire him by undercutting Kesar's price. After giving up, he finally led us back to Kesar's home where his family members recognized us, having been warned that 3 cyclists were on their way from Keylong. We were asked into the family home, where we would attempt to figure out where Kesar and our ponies were. After much discussion we understood that Kesar was still in the high altitude pastures looking for his animals. We were his first clients of the season and the ponies had not yet been located. 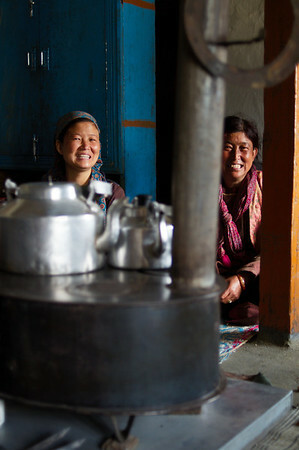 Without really having another option we spent the night with Kesar's family. 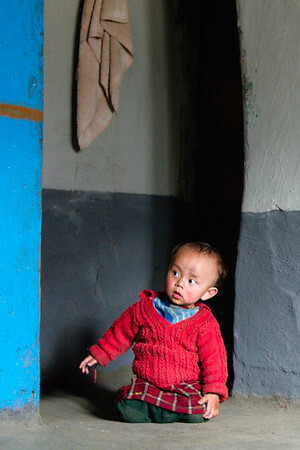 We were generously hosted by his widowed mother, his older sister, his young wife his 1 year old son Tenzin (who when we first entered the home was tethered to a used car battery to prevent him from escaping). His wife had been in the pastures as well, but returned early to report on the still unsuccessful pony search. We spent the night socializing with the women of the house, who did their best to converse with us while preparing dinner and urging us to drink Chang (home made rice wine). They even called Kesar's brother, living in another city so that we could converse with someone in English. Little baby Tenzin seemed to get used to us, but would usually cry when his grandmother left the communal room where the family cooked and slept. The home was a hub of activity with neighbours and friends coming to visit including a local monk who came to lead evening prayers. We got a small glimpse of summer life of Darcha villagers. Women work the fields, take care of the house and children and men make money from the tourism industry. 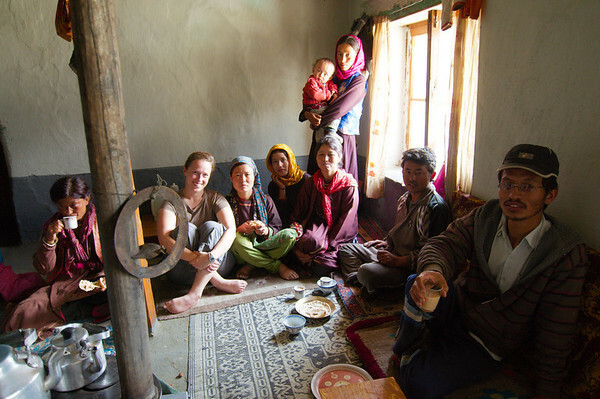 We understood that for most of the tourism season, local men would not be at home, accompanying tourists back and forth from Zanskar and Ladakh. Kesar did not return with the horses until the next morning. It had taken him over 24 hours to locate his two horses. He had slept in the pastures and found the horses early in the morning. As he only had two horses to provide he was accompanied by our second guide Tenzin who had also spent the night looking for his two horses. They both looked exhausted when they arrived for breakfast but did not object to heading out that same day. We left Darcha and Kesar's kind family cycling ahead to a campsite 9 km up the road. This would give the two men the chance to rest before following us with the horses and luggage. So our day was a leisurely one, with a short climb to Palamo, home of a desolate campsite and a tea tent that was not yet opened for the summer trekking season.